And why not? It’s a competitive world! Wisdom Times is proud to bring you the keys you need to create viral content and help you unlock even more secrets on your way to your online success. To outdo your competitor’s best content, you must first and foremost have a clear understanding of where your content stands as compared to theirs. To help you with this, there are a myriad of online web-based competitor-analysis tools that can be leveraged to provide you with valuable insights. Those insights will help you shape and optimize your content-marketing strategy. Do NOT skip this step! You’ll need it, below, in the steps to come. Next comes the crucial part—the plain Jane question on how to create viral content. While a quick Google search on the topic shells out over 4,71,00,000 results in 0.53 seconds, our first answer to this question pretty much lies with us. Simply, what kind of content do we tend to like, comment on, or share across all social media platforms? Exactly! That’s the kind of content that goes viral. We are exposed to tons of content every day. As we browse or scroll around, what makes us stop in our tracks or prods us to read more? It is invariably a catchy headline that first grabs our attention (click bait), and if the body of text is as catchy as the headline—mission accomplished! We enjoy it. We like it. We share it. Why will this work for your business, even though your competitors might be doing it also? It’s your USP that makes the difference. In business—especially if you are the owner—your customers will often find themselves in the same spot you found yourself in when you started the company. There was a problem that needed fixing or a niche that needed filling. You saw that. You took action. And you did it in a way that was different or unique from the way it was being handled in the market at that time. This makes your customers somewhat similar to you and possibly also unique to your business. In other words, if you find something that you like enough to tell others about, you can bet that other people will also. This is what viral content is about. It will spread. That’s just what happens. It’s a fact of life. The reason this works for every business—including yours—is because each of our businesses have a unique spin on what we do. Those things that differentiate us are what makes the things that I share with my group, different from the things that you share with your group. This is why viral content continues to work, time after time. So are there any other secrets to this *gangnam-style of content writing? As a matter of fact there are! Researchers, marketers, business owners have all been intrigued and fascinated by this powerful game-changing phenomena, and have spent quantifiable time in discovering the secrets behind why some content goes viral and others don’t. Hence, basically the trick to creating viral content (and therefore outperforming your competitors) goes something like this: while you enhance your content—based on the tools we gave you in the pre-game—continue to focus on the different ways to improve the core virality quotient of your content. This is also something you learn by using the above tools. That’s why we said don’t skip it! It makes the difference between finding something that is generically viral content (like a cat video) and something that is viral content for your specific demographic! Can you see the difference? This is your people sharing something that you created with more of your people! That’s the key to the pre-game section. It’s also the key to having viral content translate into more sales or conversions and not just be empty traffic. Next, make it shareable. This means more than just sharing it. Although sharing it is the next step, making it shareable means putting it in a format that your customers can easily consume and then easily pass along to someone else. This is why infographics work so well. But they aren’t the only method. There are more ideas below. Making it shareable also means having “share, like, and follow” buttons on your content as well. 1. At the very basic, fundamental level of it all, the content you put across simply needs to be compelling, quality content. Readers are more likely to quickly lose interest in an article if it is poorly written or loosely constructed without any depth or purpose. 2. To capture the attention of your reader, have a headline that instantly arouses interest or curiosity, or one that promptly connects to human emotions. For example, Jon Morrow’s viral article on ‘Why he wishes he didn’t get A’s in college’ immediately adds an element of surprise to the reader’s mind and evokes their interest. They are bound to be inquisitive to find out why anyone would wish not to have straight A’s. 3. Content marketing experts at BuzzSumo, have painstakingly analyzed the diverse social sharing dynamics of more than 100 million articles over a period of eight months. According to their study, they claim that significant social response to content was observed, and it varied based on the day of the week it was published on. Can you believe that? Apparently posting content early in the week especially on a Tuesday, plays a positive role on how well the content is received and shared. 4. As strange as it may sound, in this age of everything being instant, quick, and short, articles with a higher word count are received better than short articles. Yes, surprisingly, the longer the content is, the more shares it garners, claims an interesting discovery made by BuzzSumo study. 5. While your content brings forth your own opinions, ideas and thoughts, having statistics to back up your claims is a move in the right direction. It adds credibility and authenticity to your words. 6. Immediacy is the need of the hour. People want more information but that which can be quickly sponged up in no time. Absorbable content usually arrives in the form of list articles, like the ‘## ways to…’ or the ‘How to…’ series of articles and so forth. According to the BuzzSumo research, list articles with around 10 items are the most well-received and get way more shares than other article forms. 7. Take advantage of visual appeal, as posts with images apparently receive more attention than those without. You could also consider making your articles into visual feasts by transforming them into edifying infographics. 8. Tap into the fact that humans have this innate need to prove their self-worth. Content that makes us look good on the face of the Earth, is bound to be instinctively projected. It becomes a social projection of who we are, a reflection of our persona and helps us give people a definition or a better sense of who we are as a person. It is also in a bid to bring value or entertainment to others lives, while boosting our own. Content that helps fuel a person’s self-worth is bound to draw solid attention. 9. 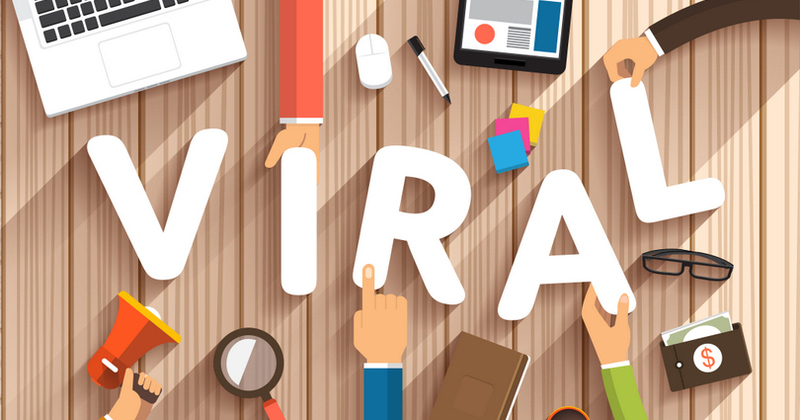 A recent research paper authored by Jonah Berger and Katy Milkman, Wharton School of Business, titled ‘What Makes Online Content Go viral’ has itself gone viral. It delves into the key aspects that foster viral content. The findings—based on analyzing hordes of viral articles on NY Times—revealed that content that triggers human emotions such as awe, happiness, surprise, laughter, anger, anxiety, etc. tend to perform better on a viral scale than those devoid of any emotion. 10. Further, the research also states that positive, uplifting and inspirational content fastidiously appealed to people and does much better than negative content. Also, practical, useful and informative content stands a good chance of becoming viral content, for its meaty role in the whole drama of viral appeal. Easier said than done, but these key takeaways could give you the nudge in the right direction and the edge over competition. And all that is left to do, is to think radically on how to put all this useful data into good practice that works for you and your business. Then go on and simply add an element of YOU to it all. As we mentioned above, you are unique and your customers get that. You bring something different to the table that no one else can. Ultimately that is what will set you apart from the rest.